The Swiss are balking at new U.S. derivatives rules, the first overseas authorities to sound off about them. But U.S. watchdogs want foreign arms of domestic dealers to follow the new plan. If global regulators won’t sign up, however, it will create an unlevel playing field. 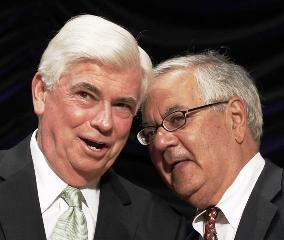 Co-sponsors of the Dodd-Frank Wall Street Reform and Consumer Protection Act, Sen. Christopher Dodd (L) and Rep. Barney Frank, are pictured at the Ronald Reagan Building in Washington, July 21, 2010. A statute within the Dodd-Frank Act that may potentially be a technical drafting error could create an insurmountable challenge for a large swathe of the US ABS market, including the one segment that has kept the market afloat: auto loan-backed deals. In a letter to Commodity Futures Trading Commission Chairman Gary Gensler, the Swiss Financial Market Supervisory Authority raised concerns about new derivatives trading rules being implemented as part of the Dodd-Frank financial reform act. The Swiss regulator said on July 5 that it worries about banks like UBS and Credit Suisse registering as swaps dealers under the U.S. rules.